As a kid, I was always fascinated by pole beans twining their way to the sky on vertical poles. They always reminded me of Jack and the Beanstalk. My mother, of course, had other reasons for growing pole beans. 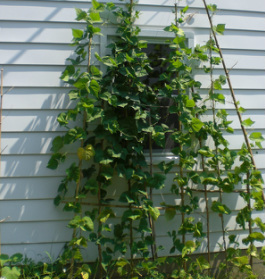 Pole beans are similar to bush beans, but produce larger pods on climbing vines. Many prefer them for their intense flavor and because they produce fresh beans over a longer period. Location: Choose a sunny location that receives six to eight hours of direct sunlight a day. Although pole beans will grow in less light, their growth will be slower and their production will be inhibited. Soil: Cultivate the soil to a depth of eight to 10 inches, removing rocks, roots and other debris. Amend with organic matter, such as compost or aged manure. Typically, a two to the inch layer spread over the soil and worked into the top six inches is adequate, but it depends on the condition of your soil. Beans prefer rich organic soil that drains well. Fertilizer: Work 5-10-10 or 10-10-10 fertilizer into the soil before planting, following the recommended application rate on the container. Beans typically do not require additional fertilizer during the growing season. If your bean plants appear weak or yellowed, apply water-soluble fertilizer designed for garden vegetables as needed. Support: Erect six-foot poles, spaced two feet apart in your garden and plant the beans around the pole. You can also use a teepee trellis made from poles, a tall fence or any other trellis to provide support for your pole beans. Pole beans require little to no training and will climb the structure naturally. Water: Water the newly planted seeds to moisten the soil, but avoid over watering. Soil should be moist, but not soggy. Keep the soil moist until seedlings appear in five to seven days. Reduce watering to once or twice a week or whenever the soil feels dry to the touch one inch below the surface. Mulch: Mulch around the base of pole beans with grass clippings or straw to maintain moisture and prevent weeds. Otherwise, keep weeds under control by handpicking or with sharp hoe. Harvest: Harvest pole beans as soon as the pods are large enough to eat. The size of the pods depends on the cultivars grown, while many reach a length of six to eight inches, some variety may reach a length of 10 to 12 inches. Learn how to make a Rustic Cedar Teepee for your pole beans.